My work as a Private Investigator consisted largely of undercover work, including stints as a forklift driver, mail clerk, Tavern Waiter, Steelworker, and lens polisher. 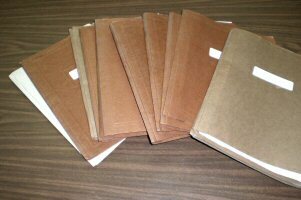 Pictured here are copies of my internal reports, known as "Internal Surveys." The focus was usually on a specific problem such as theft, but I also wrote about Fire and Safety, Administration and Operation, and Employee Attitude and Morale. In addition, I have often done undercover work in my role as a Paranormal Investigator, sometimes necessitating a disguise due to my frequent TV appearances. See "Undercover Among the Spirits" (Skeptical Inquirer, March/April 2002), "Psychic Sleuth Without a Clue" (SI, May/June 2004), and "John of God: Healings by Entities" (SI, September/October 2007).